World in chaos now. Even some territories become the worst place ever. We have Pancasila dedicate to the world. Pancasila may become the philosophy to unify the world and global peace unity. 1. Belief in the one and only God (in Indonesian, Ketuhanan Yang Maha Esa). religious tolerance and freedom of all to adhere to the religion or faith of his or her choice". 2. Justice and civilized humanity (in Indonesian, Kemanusiaan Yang Adil dan Beradab). society and state be based on a just and civilized morality. 3. The unity of Indonesia (in Indonesian, Persatuan Indonesia). Hikmat Kebijaksanaan, Dalam Permusyawaratan / Perwakilan). not only political equality, but economic, social and cultural equality. to earn their livelihood and secure a life with human dignity. The phrase is Old Javanese translated as "Unity in Diversity"
It is a quotation from an Old Javanese poem Kakawin Sutasoma, written by Mpu Tantular during the reign of the Majapahit empire sometime in the 14th century, under the reign of King Rājasanagara, also known as Hayam Wuruk. "Bhinnêka tunggal ika tan hana dharma mangrwa"
They are indeed different, but they are of the same kind, as there is no duality in Truth. 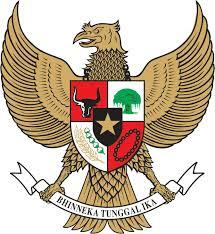 Pancasila symbolized by Garuda Bird as Indonesian National Icon. The Garuda is a mythical bird. We believe Garuda Pancasila fit to world philosophy and make world peace.